In this guide, you will learn how to successfully hire for a startup. The biggest challenge most startups face is hiring the right people. Most startups fail because they don’t know how to find, attract and hire the right people. Don’t let that happen to you! The biggest challenge most startups face is hiring the right people. ➡️ Download our free guide: The Ultimate Guide for Finding Qualified Candidates in 2019! 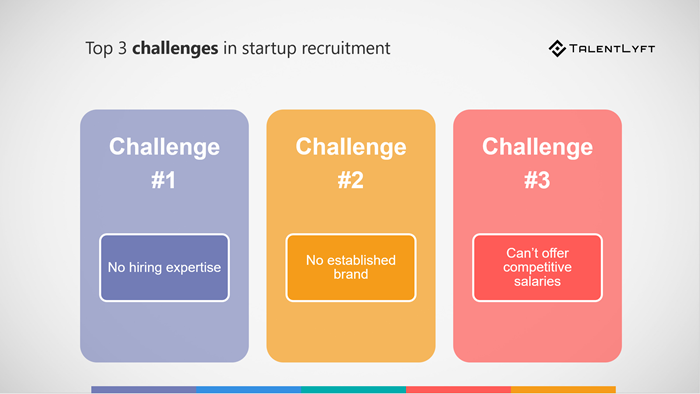 “The #1 challenge that most startup founders speak about is recruiting people. It’s not raising money, closing deals, doing sales, finding partners. It’s hiring people.”. CB insights did a research to find out why most startups fail. By analyzing 101 startup failure post-mortem, they identified the top twenty reasons why startups failed. Not having the right team was at the high third place! Bigger, established companies already have a certain number of employees. Which means that new hires have to fit in an already established company culture. When startups are hiring, they usually consist only of a few people, so every new hire has a huge impact on your company and its culture. says Yevgeniy Brikman, the co-founder of Gruntwork, a company that provides DevOps as a Service. Established companies can survive an occasional bad hire (someone who turned out not to be a good fit for the job or did not perform it well). However, startups rarely have that luxury. According to a Career Builder research, a bad hire can cost a company upwards of $50,000! 😧 It can also cause a significant loss in revenue, productivity and cause problems with employee morale and client relations. What are the challenges in startup recruitment? Small companies and startups usually struggle with a lack of knowledge, resources and time to hire. They don’t have a dedicated in-house recruiter with the right hiring expertise and experience. They struggle to find, attract and select the right people for their open positions and company. Startups are small companies just getting started, with no established brand and reputation. This is why most people are suspicious and won’t trust them. Yes, you may succeed, but hey, most startups fail, don’t they? It’s a big risk to work for a startup - a risk most people aren’t willing to take. Startups salaries can never compare with compensation packages and benefits offered by big corporations. This is why it is hard for them to compete with big brands in a war for talent. Why would top talent come to work for you instead for an established company with a great reputation that offers a much higher salary? 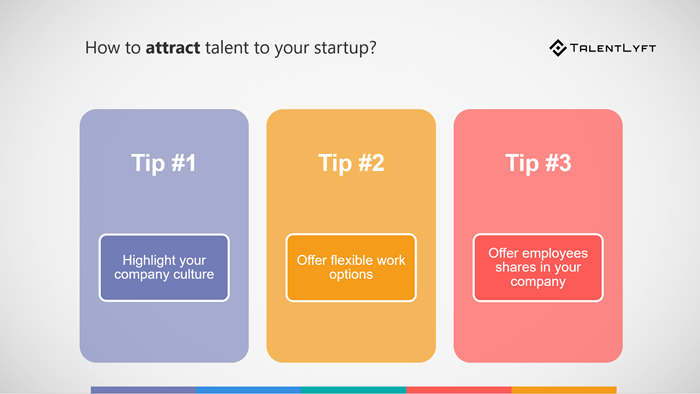 How to attract talent to your startup? So, if you can’t offer competitive salaries and people don’t trust your brand, how can you attract top talent to your startup? Do not despair - working at startup actually has a lot of cool benefits. Trust me, I know - I work in one. 😉 I could have chosen to work in a big corporation, but startups have certain tangible advantages that larger, established companies can’t (or don’t) offer. You just need to learn how to highlight them in order to attract the right people. Most big companies have strict work policies and rules. Small startups are usually much more flexible. They can offer flexible work options such as flexible work hours and the possibility of a remote work. A new survey conducted by Fractl found that, after health insurance, employees place the highest value on benefits such as flexible hours, more paid vacation time, and work-from-home options. Most companies will never offer their employees a percentage ownership in a company they work for. However, many startups will. I think this is a great practice. Offering your employees a share in your company will increase their sense of ownership and give them additional motivation to see your company succeed. How to choose the best candidates? Let’s be honest: Startups are not for everyone. Working at a startup is very demanding. Working with minimal supervision, quickly adapting to changing circumstances, constant multitasking... Most people don’t have what it takes to face this challenges and thrive. This is why it is extremely important to select the right people who can keep up with your fast growing business - and further advance it. In my personal opinion, when hiring for startups, personality is more important than skills. If you want to find the right people, those who can thrive in a dynamic startup culture, you need to look beyond skills. You need to carefully assess your candidates' motivations, look for cultural fit and hire for potential. In order to properly function, a small company with just a few employees must consist mainly of people who are able to multitask. Look for people who are willing to take on new duties and who are able to wear many hats. You’ll need them - trust me. One of the main advantages of startups and small companies is their ability to quickly adapt to changing market circumstances and needs. If you want to cash in on this opportunity, you need to hire people who are flexible and adaptable. If everything goes according to your business plan, your small startup will experience exponential growth. This is why you need to hire people who are eager to learn and able to grow with your company by taking on new responsibilities and tasks. Finally, you need to look for candidates with an entrepreneurial mindset. If you want to stand out from your competitors and outperform them, you need people who can think outside the box and who are not afraid to take risks. Look for doers, people with hands-on mentality. A final tip for startup hiring success: Make it a priority! If you want your startup to succeed, you need to make finding the right job candidates your business priority. Don’t wait until you have open job positions to start recruiting. Instead, transform your hiring process from reactive to proactive. Implement the best recruitment marketing practices, build your talent pool and invest in candidate engagement. That way, when you face exponential growth and a large number of open job positions, you will already have a pool of ideal candidates eager to work for you! Make hiring a priority for your whole company! Make it clear that everyone in your company is responsible for hiring new people, not only your CEO. Include your whole team in recruitment. By implementing an employee referral program, you can easily turn each of your employees into a lean mean recruiting machine!